English, c. 1840. Signed on the flat tripod base: J. Smith London N° 22 . The construction of this instrument utilizes a single piece of brass as the limb, connecting the optical body tube, passing through a single compass joint, with the stage supported on this limb which then connects to the substage mirror support. 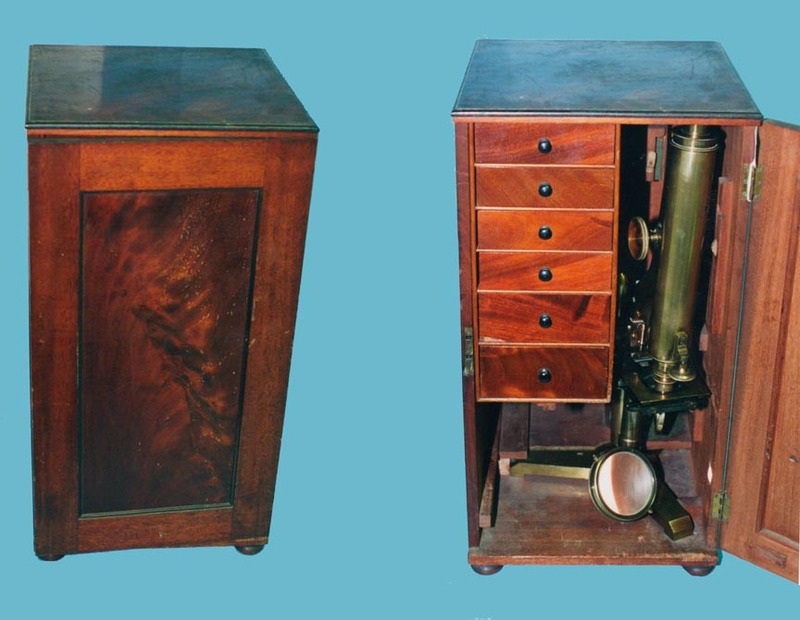 This construction is now known as the "Lister-limb" and this microscope, number 22, then is one of the earliest known examples. 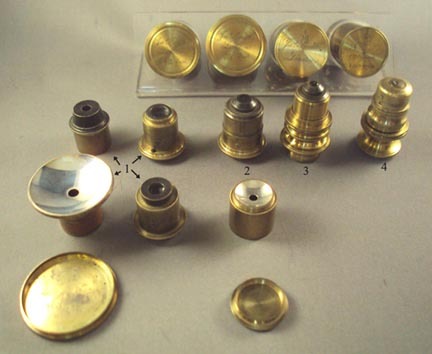 Focusing is by rack and pinion for coarse and nosepiece lever screw for fine adjustment. This instrument has an unusual stage control, known as a White Universal Lever Stage consisting of a brass-handled shaft with a ball on its mid portion attached to the limb, with its distal end a ball and socket joint controlling the stage,which is movable in any direction through an arrangement of a dovetail plate moving from right to left, and a dovetail motion forward and backward. The rack and pinion stage knobs and pinions, which were originally part of a traditional mechanical stage, have been removed, but the racks remain visible. This lever arrangement was considered ideal for following a swimming organism as it swam about on the stage in a livebox. A sterrup-controlled lever stage, controlled from under the stage, was devised by Cornelius Varley apparently in the 1820's. Some of his earliest illustrations of such a device were published in the Transactions of the Society of Arts in 1831. He subsequently developed a form controlled by a single lever, patented in 1841 and reported in the Transactions of the Society of Arts in 1843. It was Alfred White, however who first developed the above-stage variety seen on Smith's models. Although in the Smith model shown on this page had an existing mechanical stage that was modified for the purpose, within a year, as of 1841 a dedicated version of the white Universal lever stage was apparently available as it was supplied on microscope number 99. The stage on number 99, clearly an improvement over the version seen on number 22 seen here, had much more robust supports for the lever. It is interesting that the model shown on this page, number 22, which clearly dates to before 1841, had a White Universal Lever Stage. Two facts point to its later addition. First, and most important, is the fact that the remnants of a mechanical stage remain in the form of racks. Secondly, the publication announcing this device occurred three years later. The divisible objectives were sometimes referred to as "Smith's Quarters." Other makers, especially J. B. Dancer, supplied similar objectives. The 4/10 Smith objective with correction collar does not have the serial number, nor does the Ross objective. Taking into account the lack of serial numbers and that the case has no wooden fittings in the drawers except for the first two (serial numbered 22) objectives, the objectives with correction collars are likely later additions. It should be noted however, that when Smith first produced his own objectives, being tutored in this art by Lister (who at the time was working with Ross), it was agreed that he was not permitted to make them with a shorter focal length than 1/4 inch, forcing the buyer to go to Ross for higher power objectives. It is not surprising therefore, that a higher power objective by Ross is associated with this early Smith instrument. The practice of putting the serial numbers of the microscope on the objectives was apparently carried on until at least microscope number 28 (the latest example the author has seen with serial numbers on the objectives), possibly later. Although by 1856 higher power objectives with correction collars appear to be standard accessories(see Wythes frontispiece below), it is likely they were not standard accessories circa 1840. The three Smith objectives are in original cans signed in script Jas Smith, London, but the magnification for the objective with correction collar is listed above rather than below Smith's name as it is on the other two. On the Ross can the magnification is also listed above Ross' name. The Ross signature differs from Smith's in that Ross lists his occupation as Optician whereas Smith simply lists his name; Another difference is that the word London is in script on the Smith can but in block letters on Ross' can. On the other hand, cans for each of the two 22-numbered objectives are of identical style, size and shape to each other. Interestingly, the cans for the two correction-collared objectives are similar to each other in size, and tooling except for the maker signatures (one can with the signature of Smith and the Other with the signature of Ross). It is quite possible these objectives, or at least their cans, were made by the same person, or at least the same engraver was used for each. In any case, they were most likely not originally supplied with the microscope. Ross was the first to construct correction collars. Apparently his first publication on the subject was in the Transaction of the Society of Arts (Vol 51, Part II(1837-8) pp. 99-107). The lack of the serial number, the fact that the case provides customized storage only for the first two (serial numbered) objectives, and the slight difference in the cans suggests the objectives with correction collars were later additions. The Lieberkuhns, which slide onto the distal ends of the objectives, have flat brass covers that screw over their distal(silvered) ends. An adjustable substage plano-concave mirror on a pillar descends from the limb; this pillar descending from the limb is also called a "tailpiece." Coarse focus is by Rack and Pinion, fine is by short lever-screw attached to the nosepiece. The draw- tube is graduated in tenths of inches and has a threaded end to accept the erecting lens or a analyzer. James Smith, an optician and instrument maker, apparently made instruments for retailers working as a maker to the trade. In 1826, J.J. Lister, (father of the famous surgeon) apparently bought his first Smith microscope from Tulley who employed Smith. That instrument was of a Jones most improved design, except for the optical tube which included a lever-screw fine focus and was not tapered like many non-achromatic examples. According to the RMS journal, Lister asked the advice of Bates as to which instrument maker he should use, to make an improved model of microscope. He was apparently advised to see Smith directly, which he did. Smith apparently was unable to sell these Lister-inspired microscopes to retailers; Bates, Dollond, and Dixey all rejected them. This may have been what inspired him to go into business independently. 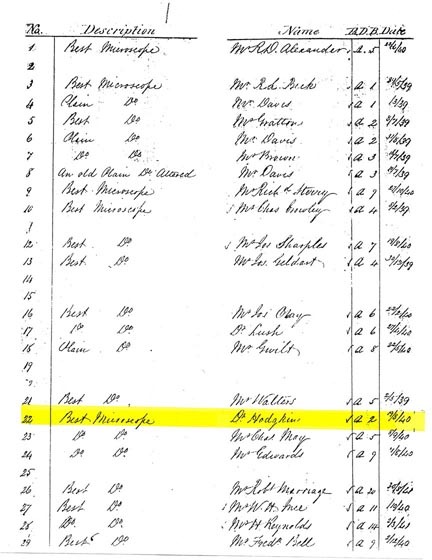 Company records show that he started numbering and signing instruments in 1839. This stand was designed specifically for his newly designed objectives (which Lister had designed). This major improvement was important to create a more stable instrument for the higher resolution then made possible by the new Lister-designed objectives. The delivery records reveal that No. 3 went to Lister's nephew R. L. Beck (Smith's future partner) in 1839, No. 22 to Dr Hodgkin in 1840, No. 41 to Lister himself, and No. 43 went to the newly formed Royal Microscopical Society as its first purchase in 1841. The Large Best Stand was one of the first that James Smith produced and signed. It was improved over the years to be supported between two pillars instead of a single-pillared compass joint. 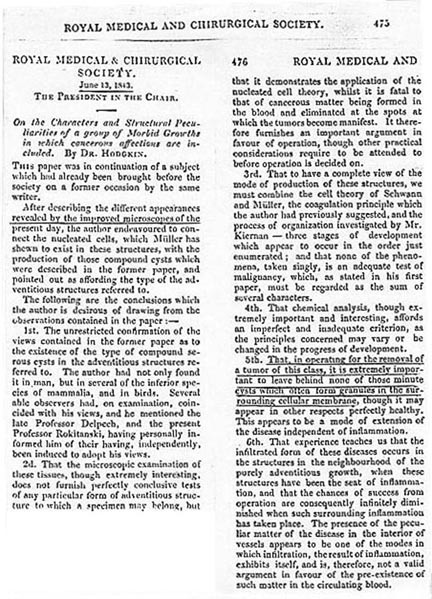 The Large Best Model, first produced in 1839, and of the same design in 1840, was featured on the frontispiece of several popular microscopy books of the times, including "The Microscopist or a A Complete Manual on the Use of the Microscope..." by Joseph Wythes MD published in 1852 by Lindsay and Blakiston of Philadelphia, and it was featured in periodicals as well. As well constructed as it was, it was the least expensive top-of-the-line microscope of the time, those of Andrew Ross and Powell & Lealand being more expensive. The "Large Best" was later also called the "No. 1 Stand" and also called the "First-Class" microscope. James Smith was the founder of his firm which in 1847 became Smith and Beck and in 1857 it became Smith, Beck and Beck. When James Smith retired in 1865, the company was again renamed, this time to R. & J. Beck. The company continued to produce microscopes well into the twentieth century. Although early versions of Lister objectives were made for Lister and Goring by Tulley, Tulley had little time to make further improvements and so Lister himself learned how to make his own objectives. The two objectives with correction collars illustrate this development of the time (1839) invented by Lister and Ross, incorporating this correction collar, for uncovered, or glass-covered viewing. Lister had perfected the aplanatic-achromatic objective lens which Smith incorporated into his microscopes, along with other improvements suggested by Lister, from 1839 to the 1840's. Lister also worked with Andrew Ross during the same period of time, particularly assisting Ross in the production of achromatic objectives. Indeed, Ross's business was known as "Andw. Ross & Co" which Turner has said really meant Andrew Ross & J.J. Lister. 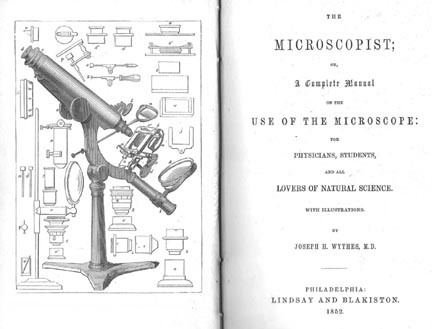 When the Royal Microscopical Society was founded, it contracted with the three major microscope makers of the time, Smith, Ross, and Powell, to each construct an instrument for the society. Smith's was the first, and ordered on August 19 1840, and the instrument was accepted by the society on November 30 1841, for which Smith was paid the considerable sum of over 46 pounds, 4 shillings. The Society Microscope carries the serial number 43, while the instrument here, Number 22 is from a year earlier. The RMS microscope is of the same construction as this one except for the White Universal Lever stage on Hodgkin's Microscope. 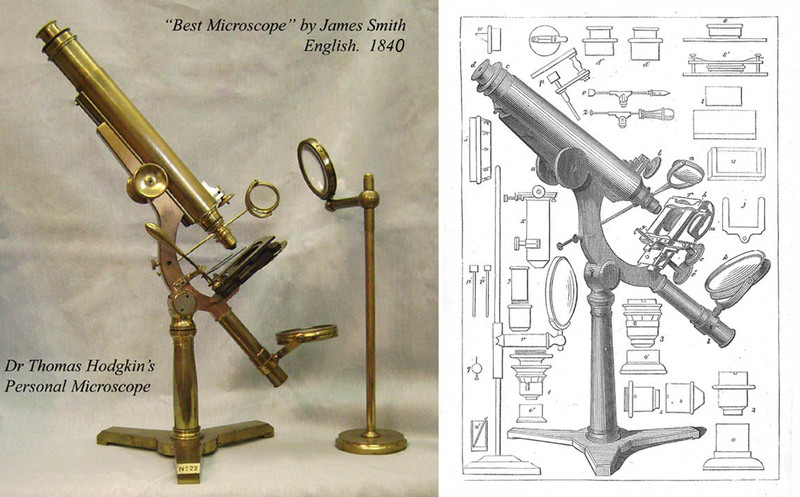 The later example of this type of Smith microscope is still in the RMS collection, and is used in the illustration facing the title page of Turner's Great Age of the Microscope. Other than the White lever stage and the serial number, the RMS microscope is identical to the microscope described above. The first owner of this microscope, Thomas Hodgkin is most famous for his description (without a microscope), of Hodgkin Disease, a malignant lymphoma. Although Hodgkin did not describe the microscopical features of this disease, he did become a proficient microscopist, and obviously owned this microscope. What is not well known to most is the importance that Hodgkin's work with the microscope had. His work with cancer using a microscope was a pivotal achievement in the history of medicine and oncology in particular. Until Hodgkin's work, metastatic cancer was thought to be the simultaneous appearance of multiple single tumors. The idea that cancer originated in one location and then spread to others had not been known. In particular, how could the cancer spread from the belly to the chest with no apparent tumor in between? Hodgkin found the answer to this and other key questions through the use of the microscope. Under the microscope he discovered tumor cells spreading beyond the visible edge of the tumor; this led him to propose the resection of cancer beyond the visible margin. Under the microscope, he saw tumor cells entering blood vessels and proposed the mechanism of distant metastasis via spread in the blood stream. As shown here, his work on cancer was published in June 1843. The revelation of a primary tumor, that spread microscopically by direct invasion, and also microscopically by blood-born metastases, is to this day a basic essential concept in oncology.